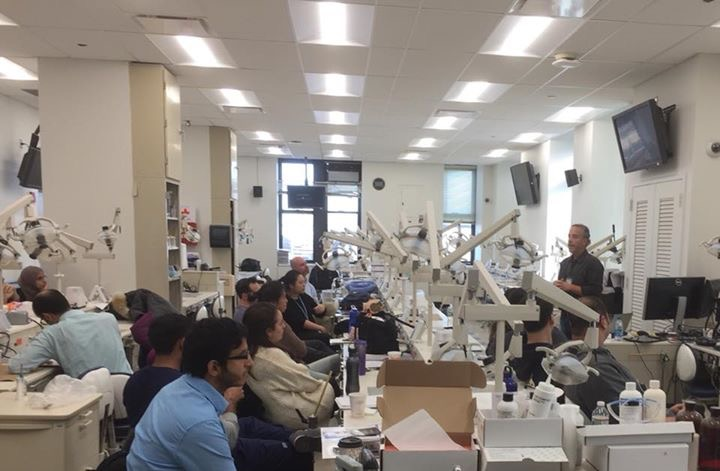 Presentation: "Lasers for the Treatment of Peri-implantitis"
Dr. Eric Linden teaching laser therapy to periodontal residents and visiting doctors from Brazil at Columbia University School of Dental Medicine and Columbia Presbyterian Medical Center ...read more . Dr. Eric Linden and guest physicist Dr. Peter Vitruk lecturing and training the Periodontal Residents at Columbia University School of Dental Medicine and Columbia Presbyterian Medical Center ...read more using the CO2 Laser on November 12, 2017. Laser Periodontal Therapy (LANAP) and Laser Peri-Implantitis Protocol (LAPIP). Dr. Linden is an innovator and acknowledged expert in the use of these highly effective FDA cleared protocols. DNA and HPV testing to help determine the state of patients’ periodontal health, as well as detect any possible genetic proclivity toward periodontal disease. This testing also checks for the HPV virus. The DNA sample is obtained by rubbing a cotton swab on the inside of the cheek. Analysis is conducted by Oral DNA Labs. The world’s highest quality dental implants, manufactured by Nobel Biocare, BIOMET 3i, and NEOSS. Click here to see animated videos of various implant applications. Digital x rays. This superior technology, using equipment from Dexis Diagnostic Imaging, offers numerous benefits to the patient, including reduced exposure to radiation, less waiting time, shorter appointments, involvement in co-diagnosis, and better understanding of treatment. Enhanced Cosmetic Gum Preservation Therapy – new conservative and non-invasive techniques to preserve and maintain an aesthetic smile. LANAP is an acronym for “Laser Assisted New Attachment Procedure”. It should be made clear that LANAP does not emit ionizing radiation, as do x-rays. We have treated pregnant patients with lasers safely for many years without any issues. To make the point perfectly clear, we administer the laser treatment without any lead shielding, as there is no harmful radiation whatsoever. 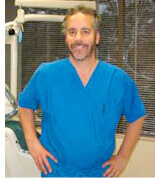 Dr. Eric Linden is a Periodontist with more than 35 years experience in periodontal and implant specialty practice. Over the last 20+ years, he has performed thousands of procedures with very predictable and successful outcomes using several different lasers, including LANAP and new laser protocols for the treatment of periodontal disease and peri-implantitis. He also specializes in bone regeneration, dental implants, and biostimulation. When necessary, he employs traditional periodontics. Dr. Linden has been appointed as a Committee Member to the Research Submissions Commission of the American Academy of Periodontology for 2018-2019. He is often requested to review research, clinical papers, case reports, and manuscripts for publication in the “International Journal of Periodontics & Restorative Dentistry“, Dentistry Today, and Implant Practice – US. He is Assistant Attending Professor, Division of Periodontics, Section of Oral Diagnostic and Rehabilitation Sciences at Columbia University School of Dental Medicine and Columbia Presbyterian Medical Center (more). He was the first periodontist to perform Laser Periodontal Surgery (LANAP) in New York City and New Jersey and is respected by his colleagues as a pioneer in laser periodontics. Dr. Linden is one of the first periodontists in the world to use four types of lasers, each of which has a specific application in the treatment of periodontal disease and peri-implantitis. Below is a sampling of unsolicited, verified testimonials that were posted on various web review sites. If you need a perio come to the best. If you think you might have periodontal disease, you are probably right! Dr Linden is an excellent periodontist. He performed surgery on me and my wife, and he did an excellent job. Run...Don't Walk to Dr. Linden's Office! Dr. Linden has been nothing short of miraculous in his care of my family. Dr. Linden is the best periodontist I have ever gone to. If you are a serious chicken when it comes to dental care this is the doctor for you! New Jersey TV NEWSChannel 12 recently taped a medical segment with Dr. Linden, including video of him performing LANAP on a live patient, and an interview discussing laser treatment, gum disease, and its systemic connections, causes, treatment, etc. Healthy Mouth, Healthy YouThere are more bacteria living in your mouth than there are people living on earth. The video belowillustrates on a microscopic level why good oral care can affect not only your mouth, but your overall health. Animated video demonstrating the LANAP process for dealing with gum disease and other periodontal issues. List of research on ResearchGate. July, 2011. Letter published in the Journal of the American Dental Association (JADA) in response to an inaccurate and misleading article regarding laser periodotal therapy. Tufts University School of Medicine Cancer Research Center. Department of Anatomy and Biochemistry. Research on Alpha-foetoprotein and Cancer Growth Factors. Cold Spring Harbor Research Laboratory, Cold Spring Harbor, New York. Research conducted with Dr. James Watson in biochemistry and cancer proliferation. Publication of research in the Journal of Periodontology entitled “A Comparison of Post Operative Pain Experience Following Periodontal Surgery Utilizing Two Local Anesthetic Agents” This study has been referenced in two other recently published studes: “Efficacy and safety of bupivacaine versus lidocaine in dental treatments: a meta-analysis of randomised controlled trials” and “A dose-response study of adrenaline combined with lignocaine 2%: effect on acute postoperative pain after oral soft tissue surgery“. "Lasers for the Treatment of Peri-implantitis"
Lasers are an effective tool for the treatment of peri-implantitis either as a stand-alone procedure or part of a clinical protocol. There are several laser wavelengths that are safe and effective for use around dental implants. This presentation will show examples of different laser approaches (open and closed flap) and the clinical indications for their use. In addition, we will examine Scanning Electron Microscopy (SEM) images of the implant surfaces after laser irradiation using different wavelengths. These images are magnified up to 50,000X and show interesting results with each laser wavelength. A brief discussion of ongoing clinical trials using lasers for the treatment of peri-implantitis will also be discussed. * Identify the different laser wavelengths that can be used for the treatment of peri-implantitis safely and effectively. * Understand what the biological effects of laser irradiation have on titanium surfaces and nearby tissues. * Utilize or suggest the laser options for the clinical treatment of peri-implantitis to their patients with confidence. These options should be part of the informed consent process. April 18th, 2018, "Role of Laser Technology for Treating Periodontal and Peri-implant Disease"
November 17, 2015 – Orlando, FloridaThe Continuing Education Committee of the American Academy of Periodontology chose Dr. Eric Linden from a large pool of applicants to be a presenter in the Innovations in Periodontics Program. Dr. Linden’s presentation was entitled “Closed Flapless Approach in Treating Peri-Implantits/Mucositis utilizing Different Wavelength Lasers”. September 30, 2015 – Dr Linden presented a lecture on “Advances in Laser Periodontal and Implant Therapy” to 50 full time practicing dentists. 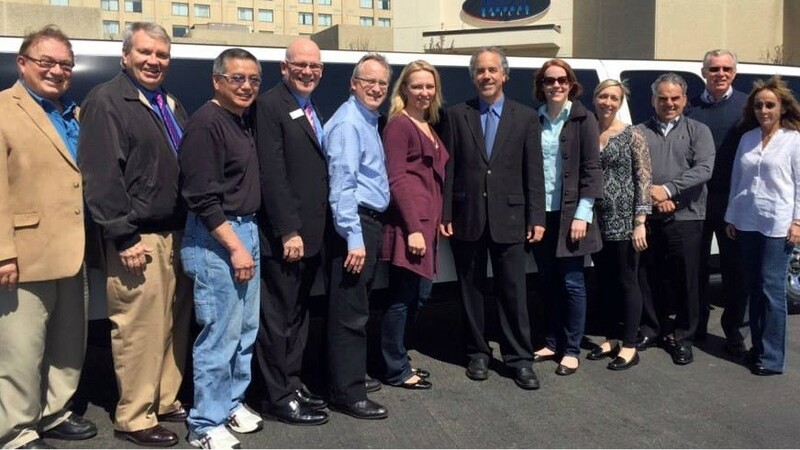 August 14, 2015, Orlando, Florida – Dr. Linden spoke as a guest expert on lasers in periodontal therapy..
Dr. Linden teaches residents and doctors from around the world who want to be certified to use laser technology. 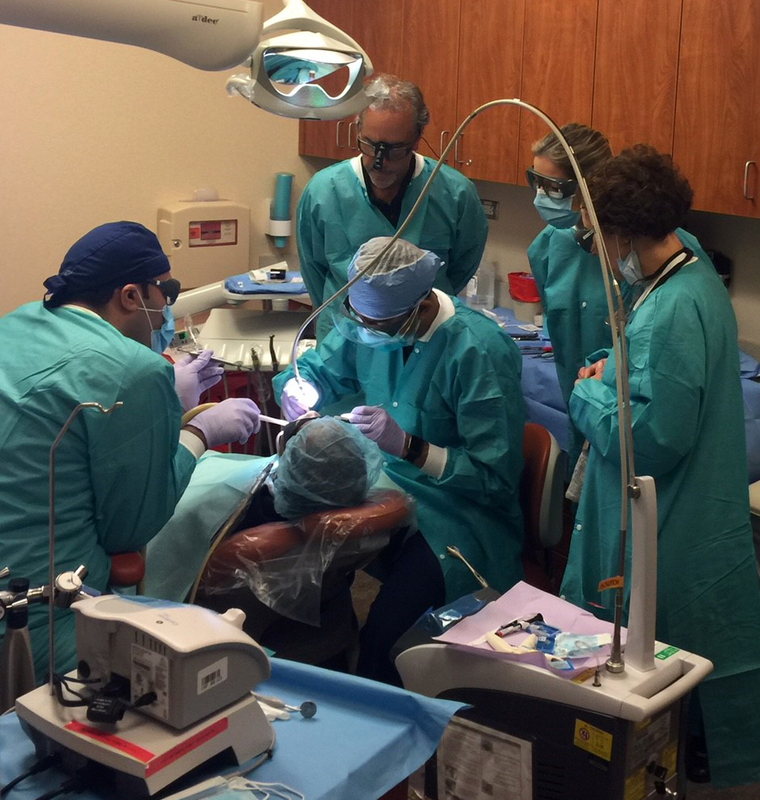 Dr. Linden was recently part of a team of doctors conducting the first laser certification training for dentists in Buffalo, New York.